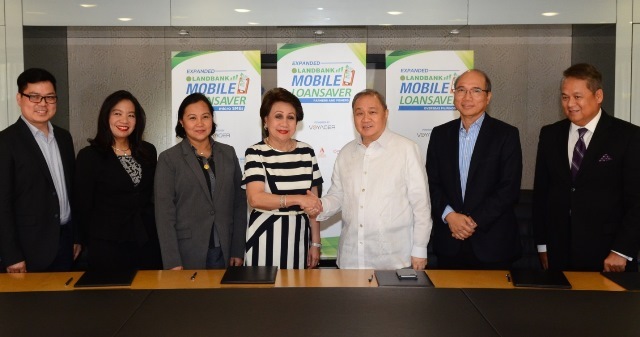 [April 5, 2016/ Manila] - More Filipinos can soon avail of loans from the country's premiere government financial institution as the Land Bank of the Philippines (LANDBANK), together with leading tech company Voyager Innovations, expands the LANDBANK Mobile Loan Saver (LMLS) program beyond its initial market of government employees. LMLS will soon cover loans for farmers and fishers, small and medium enterprises, overseas Filipinos and private sector employees. Voyager Innovations will continue to serve as the enabling technology of this service by providing the digital and mobile platform for LMLS. "Following the continuous success of our LMLS program, we are scaling up so we can serve more Filipinos through digital technologies. This is in line with our mission of enabling financial inclusion by getting more people to use electronic transactions and aligned with the government’s National Strategy for Financial Inclusion," said Gilda E. Pico, president and CEO of LANDBANK. "Digital financial services in the Philippines are off to a big start, led by a progressive partner-advocate in Landbank. We are happy to enable the bank's extension of these services to help more sectors of the population," said Orlando B. Vea, president and CEO, Voyager Innovations. "We congratulate LANDBANK for this expanded program as it is another breakthrough in the shift of consumers in using digital financial services. This is paving the way for a better and more democratized access to the banking system," said Manuel V. Pangilinan, Chairman of Voyager Innovations, the digital innovations unit of PLDT and Smart Communications, Inc. (Smart). The expansion in loans is consistent with LANDBANK’s efforts to further strengthen its credit support, particularly for key sectors and projects with high development impact. The expanded LMLS program is a result of the stellar performance of the original LMLS service, launched in September 2014 and touted as the country's first electronic salary loans program. The initial offering was limited to salary loans for government employees. "Most Filipinos have already adopted mobile and digital technologies in their daily lives and it's natural to extend this to banking services. As people grow more confident in the accessibility, security, and convenience provided by digital channels, we see more uptake of LMLS and similar services," said Lito Villanueva, managing director and head of fintech, digital inclusion and alliances at Voyager Innovations. Under LMLS, customers can easily apply and inquire about their loans using their Smart, Sun, Talk 'N Text - and soon, Globe, TM and ABS CBN Mobile subscribers - and get quick credit decision from LANDBANK regarding their application. With the positive uptake of LMLS validating an acute consumer market need, Voyager Innovations has also introduced Lendr, the country's first online marketplace for consumer loans which is expected to launch soon to enable more banks and financial institutions to leverage on digital and mobile technologies. Voyager Innovations is the digital innovations arm of PLDT and its wireless unit, Smart Communications, Inc. (Smart) focused on delivering platforms for the emerging digital economy. On top of fintech, among the areas of digital life that it is focusing on are digital commerce, digital payments and next communications. Land Bank of the Philippines President and CEO Gilda E. Pico and Chairman of PLDT, Smart, Voyager Innovations Manuel V. Pangilinan seal the collaboration on the expansion of the LANDBANK Mobile Loan Saver (LMLS) program to cover salary loans for private sector employees as well as personal and business loans for overseas Filipinos, farmers and fisherfolk and owners of small and medium enterprises. With them are Lito Villanueva, managing director and head of fintech, digital inclusion and alliances at Voyager Innovations; Leila C. Martin, First Vice President and Head of Lending Program Management at LANDBANK; Cecilia C. Borromeo, Executive Vice President and Head for Agricultural and Development Lending Sector, LANDBANK; Orlando B. Vea, president and CEO of Voyager Innovations, and Eric R. Alberto, executive vice president and head of enterprise for PLDT and Smart.